Chesapeake Humane Society is tremendously grateful to Russell’s Heating and cooling for helping us prepare our building for Hurricane Florence. The Russell’s crew stopped by to work on our HVAC system but was unable to complete their work due to the impending storm. Instead of getting back to business, they offered to assist with securing our building! Hurricane preparations that would have taken our staff the entire day were completed in just hours. Thank you, Russell’s, for this kind and unexpected gesture! While we were lucky to miss the storm, Hurricane Florence has devastated our neighbors to the south. Please join us in keeping our sister shelters and the communities they serve in your thoughts. This entry was posted in Uncategorized on September 18, 2018 by Alison Fechino. They say it takes a village to raise a child, but we know that rings true for puppies and kittens too! Recently, Chesapeake Animal Services accepted a large number of Basset Hounds including a mom with nine puppies. Because the shelter is too stressful for a mom with young babies, they reached out to us for help. One of our dedicated foster homes kept the mom and her puppies together until they were old enough to be weaned. Then, four foster homes took on the exciting but challenging task of preparing the litter for adoption! Thanks to the dedication of our foster volunteers, the hard-working team at Chesapeake Animal Services, and our caring medical staff, all nine puppies and their mom founds new forever homes during WAVY 10’s Clear the Shelters promotion. It is truly an inspiring thing to see so many forces unite to help homeless animals! We rely on our foster homes to help as many pets as possible. For more information on becoming a foster volunteer, click here. This entry was posted in Uncategorized on August 27, 2018 by Alison Fechino. Help the Chesapeake Humane Society light the 11th annual Tree for the Animals on December 18th from 3 to 4:30 p.m. You can purchase a light in honor of a pet or loved one and all proceeds benefit homeless animals in Hampton Roads. Click here to purchase a light online or visit White’s Nursery. This entry was posted in CHS News, Homeless Animals, Tree for the Animals on December 2, 2016 by Chesapeake Humane Society. A, and the Virginia Beach SPCA, now offers K9 Nose Work Classes. These exciting classes use detection dog training methods to develop your pup’s searching skills! Nose work burns off mental and physical energy, improves your pet’s problem-solving abilities, and strengthens the bond you share. Because all dogs conduct their searches individually, this is a great class for reactive or shy dogs! Visit the Happy Paws website for more information or to sign up. This entry was posted in Uncategorized on November 3, 2016 by Alison Fechino. Chesapeake Humane Society is proud to announce its newest adoption partnership with Pets for Patriots. The Pets for Patriots program serves individuals from all branches of the armed services at any stage of their careers, including retirement, by helping them overcome financial barriers to pet adoption. This program also helps save the lives of dogs and cats over three years of age, special needs pets of any age, and dogs weighing 40+lbs of any age. 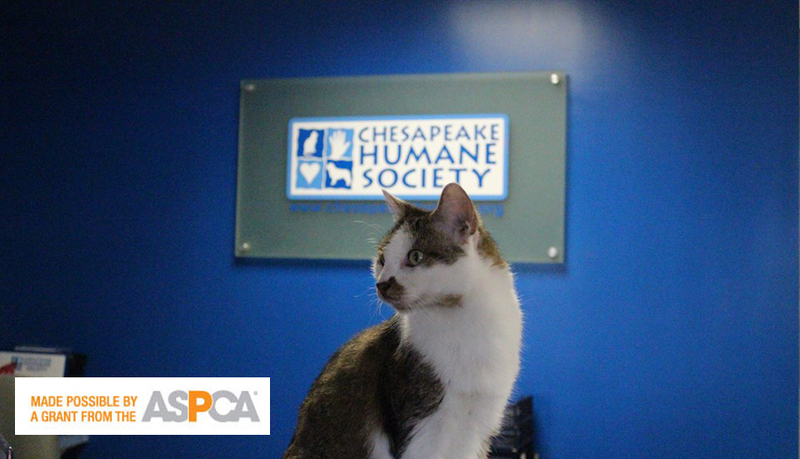 who rescue a qualifying pet from an adoption partner like Chesapeake Humane Society receive access to a virtual pet food bank, ongoing discounted veterinary care from veterinary partners, and sponsor-provided discounts on pet products. At Chesapeake Humane Society, qualifying adopters receive a $25 discount on their adoption fees. To receive benefits from Pets for Patriots, adopters must apply through the program directly. We are excited for a new way to say “thank you” to our service members and veterans! This entry was posted in Uncategorized on October 11, 2016 by Alison Fechino. The following is an excerpt from a blog post by Jennifer Milius. 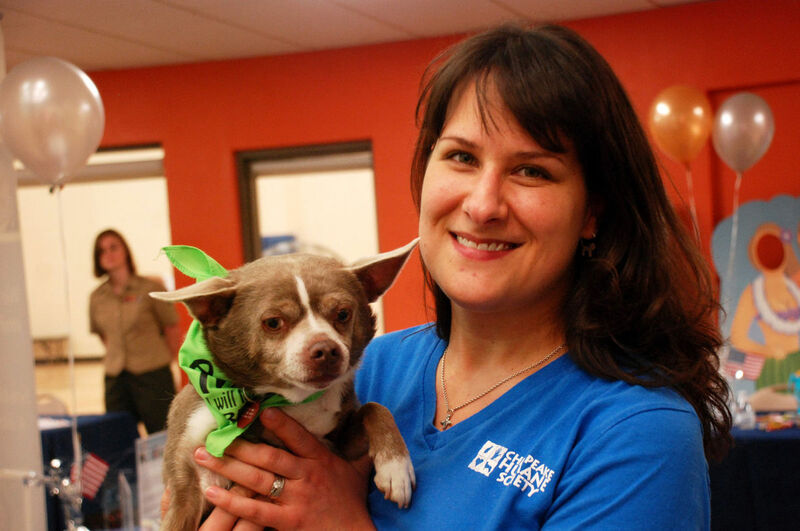 Jennifer is a Chesapeake Humane Society supporter, cat lover, and writer. She has written several children’s books about her two adopted cats, Einstein and Moo. To enjoy the entire post, please click here. This entry was posted in Uncategorized on August 3, 2016 by Alison Fechino. Nothing says summer like a romp at the beach with your dog, but what happens when Fido gets out of arm’s reach? A strong recall (“come” command) helps keep pets safe. Here’s some advice on how to train it from Tim Molina, Lead Trainer at Happy Paws Humane Pet Training. Make yourself interesting. Clap, whistle, squat, open your arms, and cheer your dog in. Once he arrives, have him sit then spill the treats. For your cat, make any sound that prompts him to come. Shake a bag of treats or open a can of cat food, then treat/feed as soon as he reaches you. Tim abides by the Top 5 Rules of Recall when teaching this important skill. Never call your pet for something unpleasant such as nail clipping, medicating, bathing, or heading home from somewhere fun. For these activities, go to your pet instead. Never call your pet if you are not sure he will come. All recalls should be successful recalls. Work at your pet’s level. If he has a kindergarten level recall, don’t give him a graduate level assignment like being called away from a playmate or tasty treat. Interested in learning all 5 Rules of Recall? Check out the Total Recall Course at Happy Paws. This class will teach you how to train your dog to come when called, even with distractions. While this course is just for dogs, remember that cats can be taught the recall command too! Happy Paws is a collaborative project of the Chesapeake Humane Society, Norfolk SPCA, and Virginia Beach SPCA. Training offerings include individual consultations along with obedience, agility, shy, and reactive dog classes. This entry was posted in Uncategorized on July 6, 2016 by Alison Fechino. Casey was one of “long-timers” but I’m very pleased to report that this fella has been adopted! He is an older cat with diabetes, which means that he requires a special diet, two shots of insulin every day, and frequent trips to the vet. He certainly required a home that was willing to provide all of this for him … not an easy task to take on. Thanks to a generous grant from the ASPCA, his medical care has been covered for the past six months AND he has found a loving forever home! We are very grateful to our adopter and for the grant which specifically covers medical care for cats with special needs (like Casey!) and in hospice care, made possible by Lil Bub‘s Big Fund for the ASPCA. This entry was posted in Uncategorized on June 11, 2016 by Chesapeake Humane Society. Lacy Kuller, CHS Executive Director, recently participated in the YMCA’s Active Older Adults Day. She brought along Henry, a five year old Chihuahua mix, to promote their Seniors for Seniors Adoption Program. If you are interested in meeting Henry, he is currently available for adoption at Chesapeake Animal Services. Click here for the full article in The Virginian-Pilot. This entry was posted in Uncategorized on June 7, 2016 by Chesapeake Humane Society. This entry was posted in CHS News on March 11, 2016 by Chesapeake Humane Society.